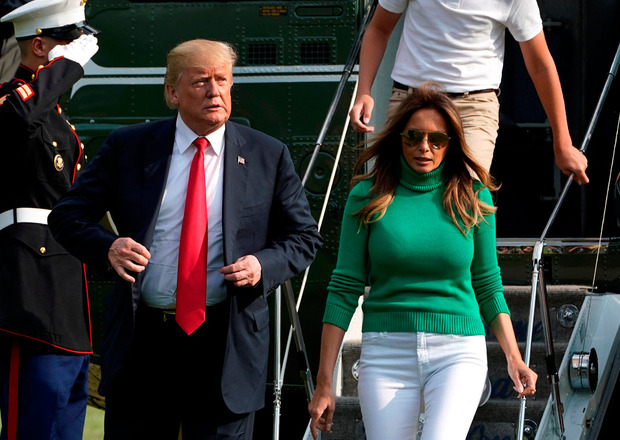 Melania Trump has warned about the “destructive and harmful” impact of using social media incorrectly – while her husband was busy settling scores with typically aggressive messages on Twitter. America’s first lady used a speech at a cyber-bullying prevention conference yesterday to stress the importance of teaching children about the “safe and responsible use of social media”. Yet as she was issuing the warning on the outskirts of Washington, Mr Trump was in another part of the city sending barbed tweets. The US president wrote that Robert Mueller, the man leading the Russian election meddling probe, was “disgraced and discredited”, and called John Brennan, the former CIA director, the agency’s worst leader in history. A spokesman for Ms Trump played down any link between the first lady’s comments and the president’s tweeting. Ms Trump formally launched her ‘Be Best’ campaign aimed at promoting the well-being of children in May. Appearing at the Federal Partners in Bullying Prevention cyber-bullying prevention summit yesterday, she delivered a short speech. “In today’s global society, social media is an inevitable part of our children’s daily lives,” Ms Trump said. She went on: “By listening to children’s ideas and concerns, I believe adults will be better able to help them navigate this often difficult topic. Before and after she spoke, he husband was using Twitter to call out his perceived critics, tweeting that Mr Mueller, the special counsel, and his legal team were a “national disgrace”. Mr Trump also wrote that he hoped Mr Brennan – who was stripped of his access to intelligence last week – would sue so documents could be published showing he did a “poor job” at the CIA. Stephanie Grisham, the first lady’s communications director, was asked why Ms Trump continues to engage on cyber-bullying prevention when Mr Trump uses Twitter to insult people. She responded: “The first lady’s presence at events such as today’s cyber-bullying summit elevates an issue that is important to children and families across this country. She is aware of the criticism but it will not deter her from doing what she feels is right.